I tend to talk and write a lot. What can I say I talk, I type and words just come out! So I’m attempting to rattle on less tonight, it’s getting late and I need to sleep 🙂 otherwise I end up SewCrankyLizzy. Voting is now open on the Pattern Review website for the RTW competition. I’m quite sure that there are a few entries there that are going to smash my humble little gingham shirtdress but I’ve decided that if by some miracle I do win the $200 Mood voucher, I’m going to buy something (in addition to my dream Anise fabric) to giveaway on my blog. I figure you all want something from Mood Fabrics just as much as me – so part of being happy is about sharing it around 🙂 You are all so generous and kind to me, I would like to give a little back in the form of Mood fabulousness if possible. I guess that would be interpreted as an enticement but it’s not intended that way. A lot of what I have achieved has been inspired by your kind words and encouragement, you are all as much a part of my sewing as me. Maybe I should have wait til after the competition. Ah, I prefer to be upfront and just say things like they are. It’s just something I want to do & it’s not an afterthought Read more about this project here. 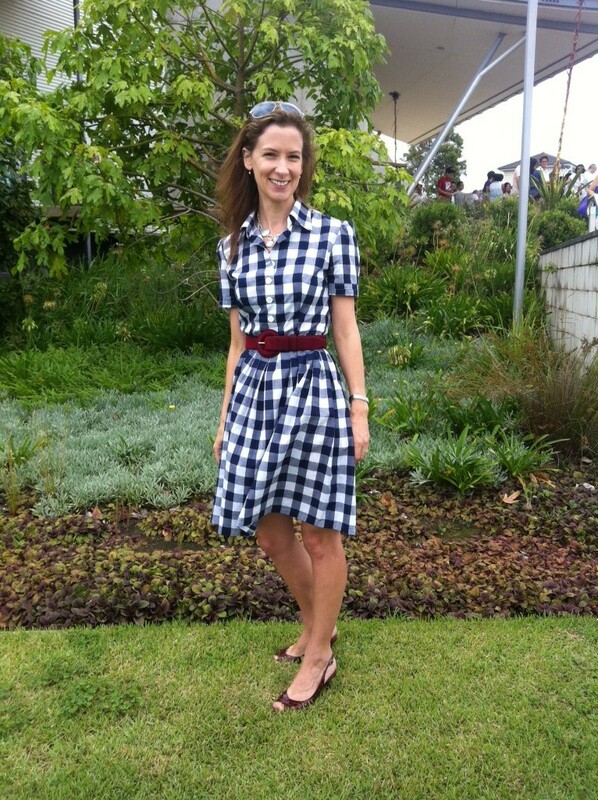 My Shabby Apple RTW inspired dress – I love it with my dark red belt, patent red slingbacks. I have worn this A LOT. Making it a sewing win regardless of Pattern Review competition outcome. 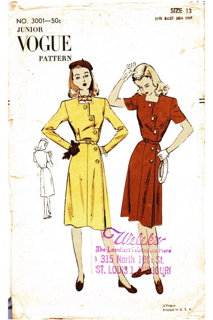 I’ve also made up a vintage pattern – see if you can pick which one…. Thank you SuzyBeeSews! The bodice of this is very much like the Peony but it fits without alteration. I made this from an old doona cover from a charity shop – I as nervous about the fit but it fitted perfectly. The skirt is a little too gathered for the dress, I just used all the leftover fabric once I cut out the fabric. I didn’t have enough doona cover for the flared skirt in the original. I love this bodice. I want to make the dress again – sleeveless version. Vintage McCalls. That’s one of my beloved pieces of furniture, a early 1900s settee, from my childhood bedroom. I’ve been distracted by Sewalongs. I can’t help myself. I have almost finished my New Look 6000 for Scruffy Badger’s Polka Dot NL 6000 sewalong. It’s more splodge-a-dot but I like it. I love this pattern. I confess I had been put off it because the envelope was so thick LOL. The neckline on this is not playing nice, it looks smashing but the facing does not want to stay put – damn you drapey fabric… although the pleats look lovely… I want to make it in a ponti fabric for work. Love this pattern. Sew for Victory. An original 1044 pattern. I’ve decided that my London trip is too close and I would like to attempt to make a jacket to take. Hmmmm, I know ambitious…. Burda 03/2013 jacket. A pretty wool blend. Tessuti package – how awesome is that packaging!! This entry was posted in Dresses, Jackets, Vintage Patterns and tagged Burda Style, butterick, New Look, Pattern Review by sewbusylizzy. Bookmark the permalink. Gorgeous things! You have been the Busy Lizzy! I cant wait to see the Tessuti fabric in action- whats the plan? Hmmm many ideas. I’m thinking dress & bolero, it’s reverse side makes things interesting. Possibly vintage. Got some RTW inspiration on the weekend. They’re all beautiful but I’m particularly in love with the vintage dress made from a doona cover and your splodge-a-dot offering. Lovely jacket fabric, too; and if you have time, yes, makea jacket to show off in London. It’s a fancy doona. I had resisted cutting it as it felt so lovely. When I cut it up I realised why, it’s Sheridan! New Look is lovely. I think I have a pattern crush. Beautiful stuff! I love it all but I’d probably get the most use out of the lacy cardi — just darling! I can’t wait until I have the energy and stamina to her back to my sewing machine. It feels like it’s been so long! The cardigan is so cute and I’m not usually one for lace! Hope you are back sewing soon. it’s all so beautiful i don’t know where to begin! 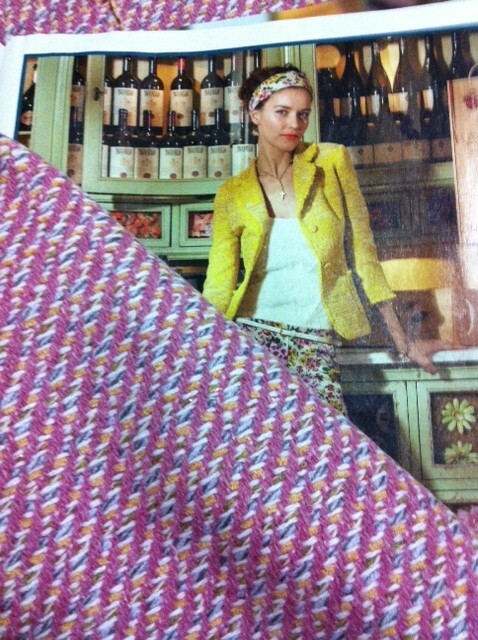 the burda jacket pattern is so cute, can’t wait to see that one made up! and your dresses are lovely. good luck in the contest! Your shirtdress looks so good. I always feel like shirtdresses never really look as good as you feel like they should, but yours is perfect. I also adore your vintage dress with the rick rack on the sleeves. I’m a sucker for rick rack. And your New Look 6000 is coming along! I have that pattern too, but I get nervous that the pleats will come out weird or something. But I’ve seen enough successful dresses that maybe I should just bit the bullet and do it. That Sew for Victory pattern looks really interesting. I can’t wait to see how it looks all sewed up. I love shirt dresses and this one is easy to wear anywhere, I have plans for at least two more! I thought NL 6000 was going to be tricky with the pleats but it is very simple to put together, it’s easy to see why it’s so popular, simple and flattering! I love your version of the New Look 6000. I’ve just bought this pattern so I’m looking forward to having a go! Go for it, it’s very easy! Love your shirtdress and I really wanna see this lacy cardigan! LOL it is easy to be distracted when your hobby involves pretty fabric & patterns!! 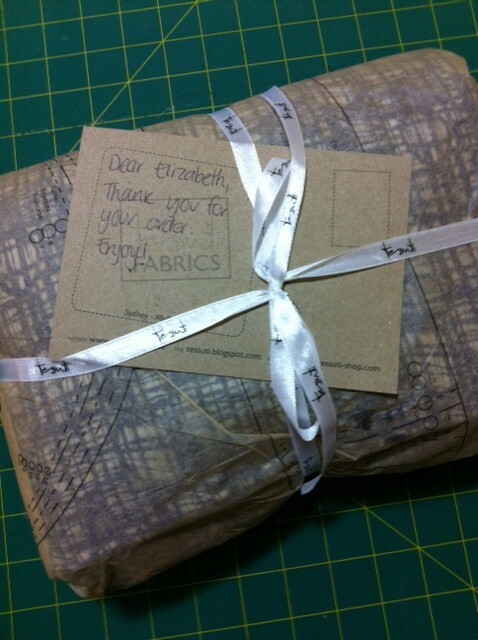 Oh I’m definitely SewJealousSabs at the moment – your offerings are wonderful! I’m umming and aahing about whether I should buy NL6000 (altho think I’ll be too late for the polkadot fest) and yours is tipping me towards “yes” I think… Your shirt dress is fab (and I’ve voted! )… Your vintage duvet dress is gorgeous and looks far better being shown off as a dress and I really want that Tessuti fabric but the P&P is too much all the way to England. Damn. Can’t wait to see what you make with it tho! I would recommend NL 6000 – I’ve had trouble with the neckline but I used a drapey fabric. Other have issues with the back fit but I just straightened out the centre back seam which seems to accommodate a hunchback. It’s one of those patterns which seems to flatter most and is surprisingly easy to sew – don’t let those waist pleats scare you. I ordered the pattern for the lace cardigan as well. I loved it! Can’t wait to see how it turns out! I love your gingham dress, will be delighted to vote for it! And, that second floral dress is SO PRETTY!! It’s actually how I am picturing and hoping that my de-80s-fying project will turn out! Posted it here: http://gjeometry.com/2013/03/04/pattern-pyramid-pick-progess-de-80s-fying-and-a-sewing-dare/ What do you think? Will it come out like yours? Which patter is it? I went to the link but having some trouble identifying which one you used. Want to know if it’s similar to my Vogue one. (that should say “which pattern is it”, -your dress). (forgot to mention I also love your polka dot fest dress. So flattering, that style! It’s a OOP on the Vogue site http://voguepatterns.mccall.com/v8028-products-6783.php?page_id=940 I altered the skirt and used the longer sleeve – just shorting it. I didn’t want puffy sleeves. I think that if you use two fabrics it will work on your dress. I think that using a belt will make it look like a shirt and a skirt. Good idea. Ah, ok. I could not figure out what pattern you had used! So far, the sleeves are looking a might boxy, not sure if I will shorten them, or narrow them. Everything you made is beautiful and your upcoming projects- you ARE busy! Wow you have been busy. They are all fantastic dresses. Sorry I have only been PR member for 2months so am not allowed to vote. I love the sew for victory pattern you have chosen, but it does look likeit will need some focus. I am also inspired by the cardi. I may need to look out for that burda magazine. Yes I just don’t have enough time to Sew for Victory as I have my daughter’s birthdya coming up and Easter. Just too many things to do before I fly to London! Oh, make the jacket! You’ll be so glad you did! I’m thread tracing it now! All so pretty! I love the oversized gingham. You really can rock a shirtdress! I think I need to sew more shirtdresses. I love wearing it! Love these dresses! I hope you win. I’ll be keeping everything crossed for you. I’m getting distracted with sewalongs too. I have sew for victory, mad men 2, my sewing dare and I really want to do the elisalex dress and tessuti competition. So many sewalongs! I need to get some comp fabric actually so thanks for the reminder! I’m thinking about Mad Men as well but I think there are just too many things going on in blogland to do them all. All are such beautiful dresses. Good luck with the contest! Best of luck in the PR competition! Your shirtdress is the perfect combination of style and comfort. I love the fabric of your vintage McCalls dress – what a great find. I really need to check out thrift stores. Like other commenters I have NL6000, but have yet to make it up. It’s behind my Cordova, 2nd Charlotte, Pavlova, Mathilde…. See, I’m easily distracted too! I have found so many things in thrift stores this year. I think post-Christmas clean-outs might have something to do with it. Not so many patterns but loads of fabric, including several lovely bits of wool! So many projects so little time. Love the burda jacket, it may be more practical than the lace button up UK weather wise, your call. Can’t wait to see what you do for the Tetsutti comp!! Wow, you’ve been so busy! Love the vintage dress, would never have picked that it was a doona cover! 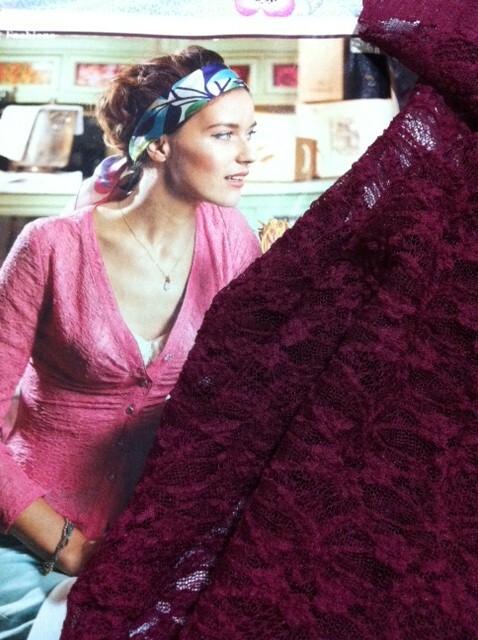 I haven’t got the latest Burda yet but I really like the lace cardigan, can’t wait to see that made up. I’ve voted for you too, I think your dress is the nicest in the rtw comp so good luck! I love that vintage McCall’s with the pretty trim you added to the sleeve edge. It looks perfect on you. I can’t imagine how excited you are about your trip. The Raspberry stretch lace will be assume. The vintage pattern is lovely to make and wear. Classic and comfortable. I’m very excited about my trip. Hoping to finish the pink jacket in time – I think the raspberry stretch lace might be an ‘easy win’ project in the middle. It looks simple. Ah, and the scourge of focus, hey. I have no words of advice as I am incorrigibly distractable. The vintage lounge was my grandmother’s so it’s rather precious. Yes I’m hopeless at Focus… too many pretty fabrics… and oh look there’s a pattern… ribbon… it is dinner time? Girl, you are a MACHINE! I must say, that vintage dress caught my eye right away. I can’t believe that was an old doona cover…it’s just so beautiful!!!! Can’t wait to see what you make from your Gridlock! You’ve got my vote right now! The fabric felt beautiful so I resisted cutting it up even though it was destined to be a muslin. When I cut it up I found the Sheridan label – which explains the high thread count, pretty print and lovely feel. LOVE the vintage dress and adore the settee even more. NL6000 is gorgeous, feeling the love there too. I love the Tessuti packaging, so beautiful. Don’t you hate it when a shop jams a lovely piece of fabric into a skungy plastic bag. Gardams in Brisbane still wraps everything in brown paper tied with string, how environmentally friendly and almost makes up for the prices, sigh. The settee was from my grandmother’s house. It’s just perfect. I love attention to detail in shops, it makes the experience worth every cent. Wowzer! All these projects are smashing! I love all of these, but the vintage dress is particularly sweet! Who would have thought bed linen was so wearable? What a pretty dress! I love that dot-fabric. I might make that lace cardigan too, but I’m a bit anxious about sewing with lace. Have you started already? I would love to hear your experience with the pattern and the lace.